Ben Hansen, former host of the SyFy Channel’s Fact or Faked: Paranormal Files, took a careful look at Obama’s recent appearance on Jimmy Kimmel, especially the portion in which Kimmel asked Obama about UFOs. Hansen says his analysis has given him some “huge” revelations, including that Obama was not joking when he told Kimmel that he can’t reveal what he knows about UFOs and extraterrestrials. Hansen has a background in law enforcement. However, he points out in his video analysis – which he posted on YouTube (seen above) – that he is not a body language expert, just someone with a lot of experience conducting criminal investigations and interviews, and working with body language experts. This led Hansen to believe that Clinton knew more than he was sharing or he learned just enough to indicate that he should stop looking. 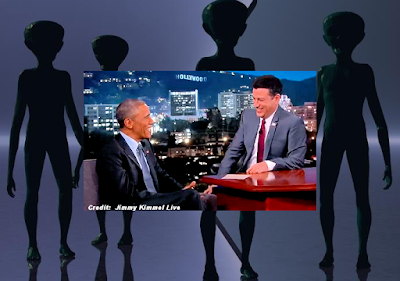 Earlier this month, Obama appeared on Jimmy Kimmel Live!, and Kimmel decided to ask him about UFOs as well. In the interview, Kimmel indicates that he may have seen Hasnen’s Clinton analysis. Kimmel warned Obama that people were going to look at his facial expressions and every move as he answered these questions to analyze what he was saying.